Even the most gentle current is a bonus when it's going with you. Yes, there was a flow on the Lillalven as we threaded our way through a reedbed downstream of the beaver lodge. The boat was heavy and the push that the current gave was very welcome. Our route followed the Lillalven into and out of many lakes. Like all wilderness rivers this one has beautiful serene sections that could only be found by travelling on the river itself, it does not give up it's secrets to just anyone. You have to live with the river to find them. There was a nip in the air, just enough to remind us that this land can still bite despite benign weather. Julie needed that Buffalo Special 6 shirt and her Reed Chillcheater Transpire fleece polo neck and tights, I was wearing my Cascadas, Cambia long sleeve t-shirt and Torres gilet and was fine as long as I kept up a steady cadence with the paddle. Paramo! 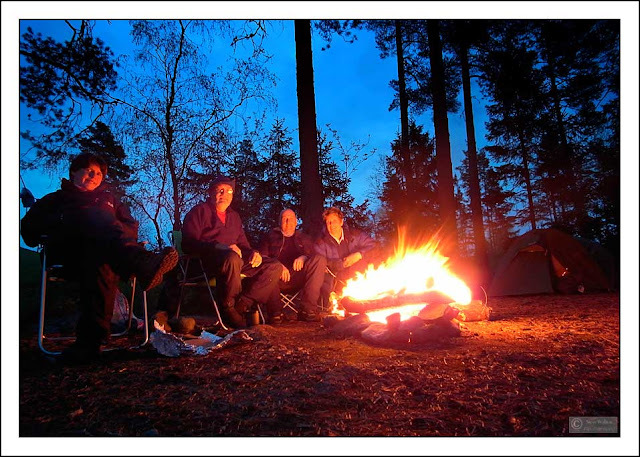 Who would think that a range of outdoor clothing could produce so much heated debate on outdoor fora. Without wishing to fan the flames, I can say that Paramo works well for this kind of expedition. I wouldn't take anything else. Here's one of the culprits responsible for presenting us with our first frustrating obstacle. You can't help but admire these fascinating creatures. I like anything that possesses an innately wicked sense of humour! He (she?) was playing with us. 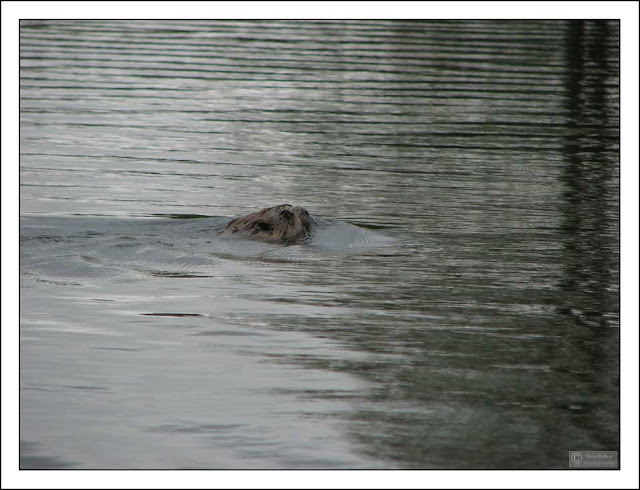 Under the boats, following the boats, watching us from behind tree roots on the riverbank. They know when they've briefly made your life difficult. It shows in their grin. Other obstacles were rather more problematic. The river narrowed for a while and the current increased through a rock garden with a small drop on the left-hand bend just downstream of me here. This was the only section where we had to line the boats through faster water as the rocks became too numerous to paddle through. 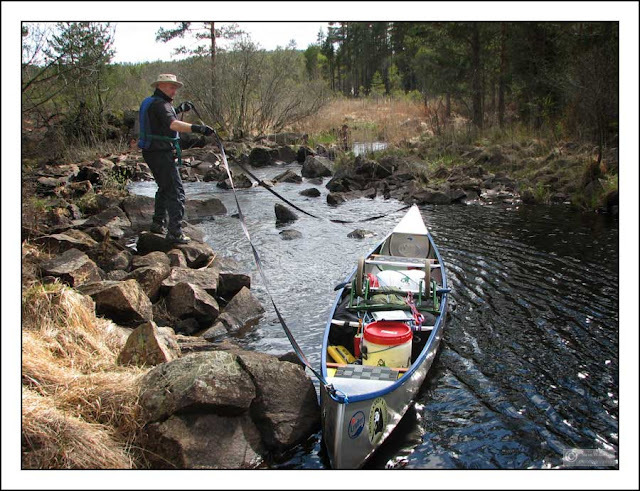 Lining is an art that all open boaters need to master for river paddling, the tedious alternative of unloading the boat to carry it around the difficult sections would not be a welcome prospect. I was being a little lazy with the kit here. I used two 3 metre tie-down straps instead of the two 10 metre floating lines I had in the boat. They did the job ok! Routine is a necessity on any multi-day trip. You complete one task and move on to the next in a logical manner. That way, nothing is lost or overlooked. 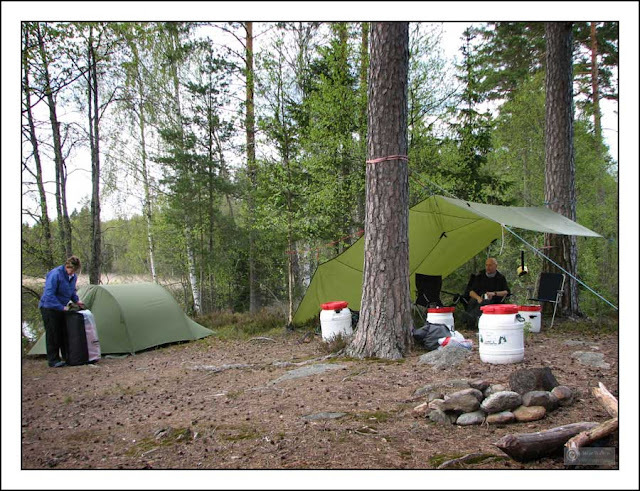 The tarps took priority over everything else when we decided on a suitable campsite and they were always the first thing to be set up. 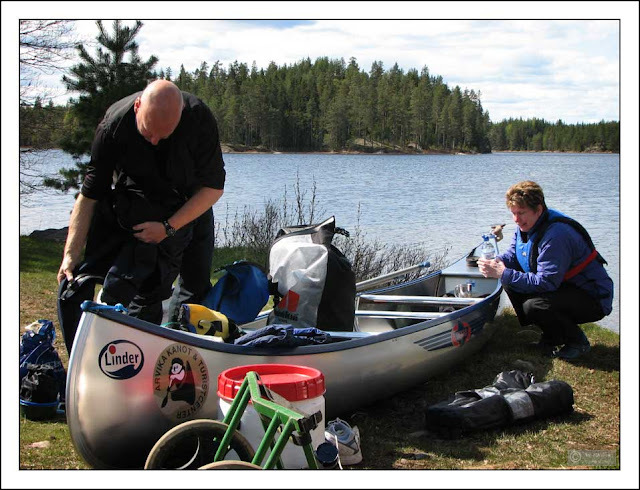 Everything else then becomes much easier, you have a dry area to work in and sort out gear, brew-up, eat and relax. 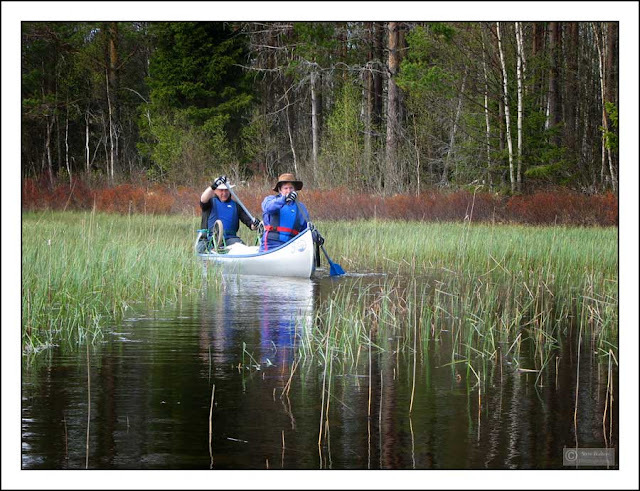 Tarps are one of the greatest assets in a wilderness canoe trip. Angie's needlework is as impressive as Dave's tarping expertise. Big is good. Bigger is better! In May, the temperatures always dropped rapidly as evening approached, sometimes with added wind chill. Don't be fooled by the sunlight! A good fire is essential for comfort in the evenings. 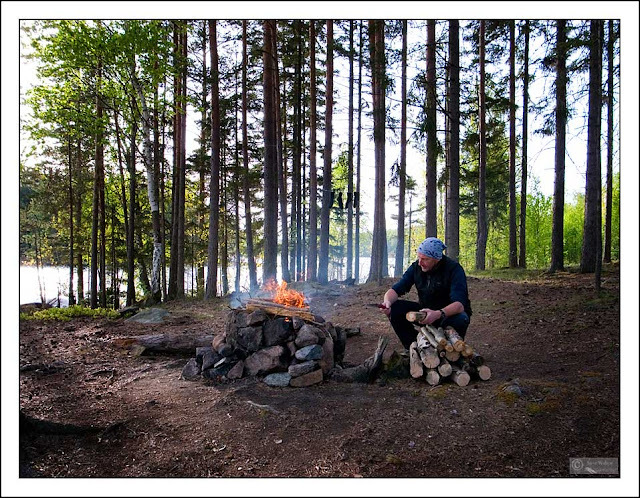 At this time of the year, there are rarely any fire restrictions in Varmland, but that doesn't mean that anything goes. A wildfire would be devastating in this area, so care and common sense is paramount. I always build a fireplace or repair an existing one. The saw is a folding pruning saw, not expensive but worth it's weight in gold. It cuts in both directions and will go through 10-inch diameter pine in a couple of minutes. Make sure you buy one with a blade lock to stop the saw accidentally folding on your hand as you cut! If there is one bit of kit that I simply could not be without, it's my Bushbuddy wood burning stove. Uncomplicated, dependable, beautiful. The Bushbuddy has soul. You know you're wilderness camping when the Bushbuddy is working it's magic. A mug of Earl Grey tea made with the stuff we have been paddling on. Tea doesn't come any better than this, who needs milk! 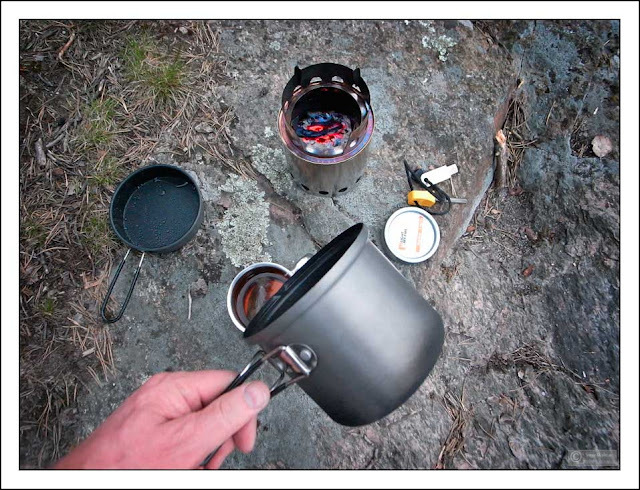 The pot is a 1ltr Primus Litetech Trek kettle, this lightweight non-stick coated, anodised aluminium pot with frying pan complements the Bushbuddy perfectly. The small Light My Fire firesteel and a White Box Solo meths burning stove all nest inside the pot and the tin of Maya Dust sits on top of the frying-pan lid with a spork down the side in the mesh stuff sack. 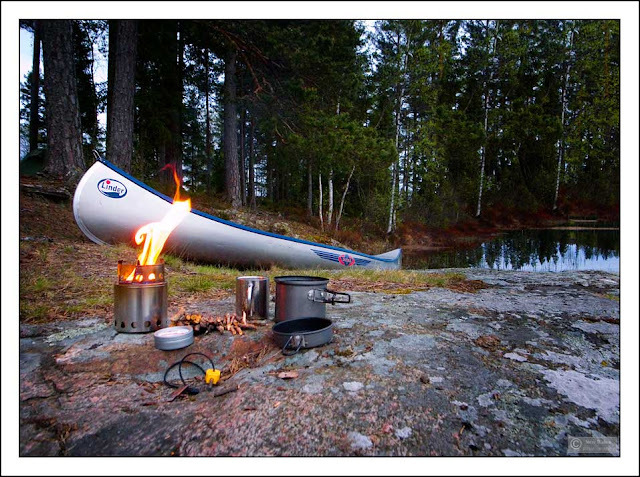 It's a neat and versatile multi-fuel cooking option. Darkness falls quickly and the forest is once again our home for the night. Routine. Dinner is finished, the washing up is done. We pass the Tullamore Dew around and keep warm by the fire. 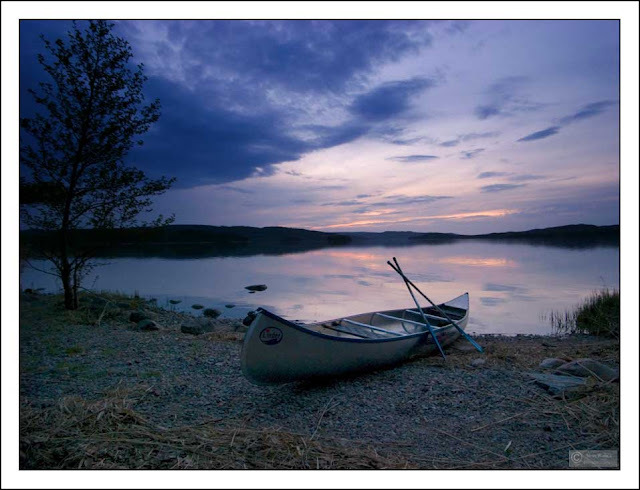 Tired from a long day's paddling, looking forward to more of the same tomorrow. Magical moments, good company in dear and trusted friends, making great memories. Four more essential items of gear are the £5 folding shovel I picked up from Go Outdoors in Loughborough, Dave andAngie's Ortlieb folding washing-up bowl, my lightweight folding bowl from BPLUK and a good supply of baby wipes. Life in the forest would be very different and less pleasant without these. Dusk. I've watched the sun go down and the onset of darkness in many places. Sometimes it's from a peak, sometimes from moorland, sometimes across water. Evenings when the breeze stills and those interesting sounds travel across water are the best ones. I heard bittern booming from a reed bed across the lake on this evening. A pair of ravens flew overhead, calling as they went. Routine. The boat is packed in exactly the same way as the day before and the day before that. Another day, a way of life. (Image below is reproduced by kind permission and is copyright of Angela Kirk). Wonderful stuff. I really enjoy reading about other ways to travel through the wilds. What camera set up did you use Steve? Most of the images (all of the 3:2 format ones) are taken with a Ricoh GRD2 with wide angle converter. This is my standard 'notebook' camera equipment. I don't need a zoom lens and I like the reasonably fast f2.4 lens on the GRD2.